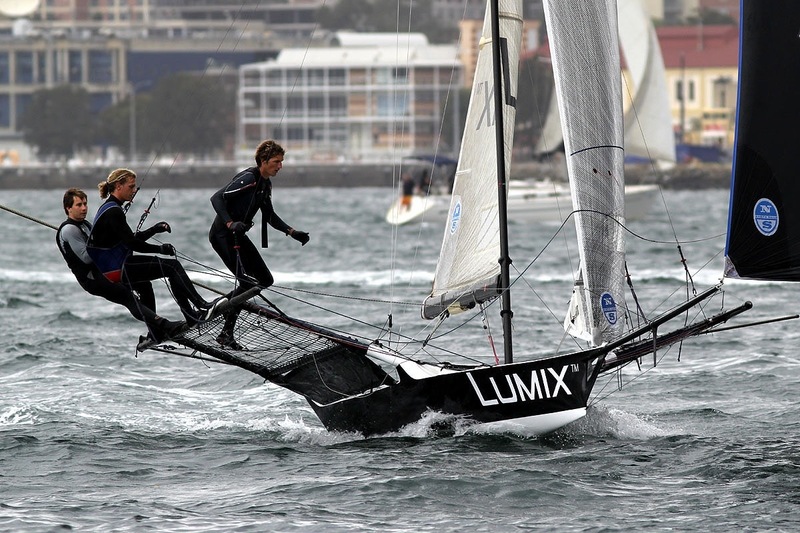 Jonathan Whitty’s Panasonic-sponsored Lumix became the seventh winner from as many races in the series when she won Race 7 of the 18ft Skiffs AEG 3-Buoys Challenge on Sydney Harbour today. After a moderate start, Whitty and his Lumix team of James Hozack and Archie Massey moved through the fleet to take the lead on the second lap of the four-lap windward-leeward course. 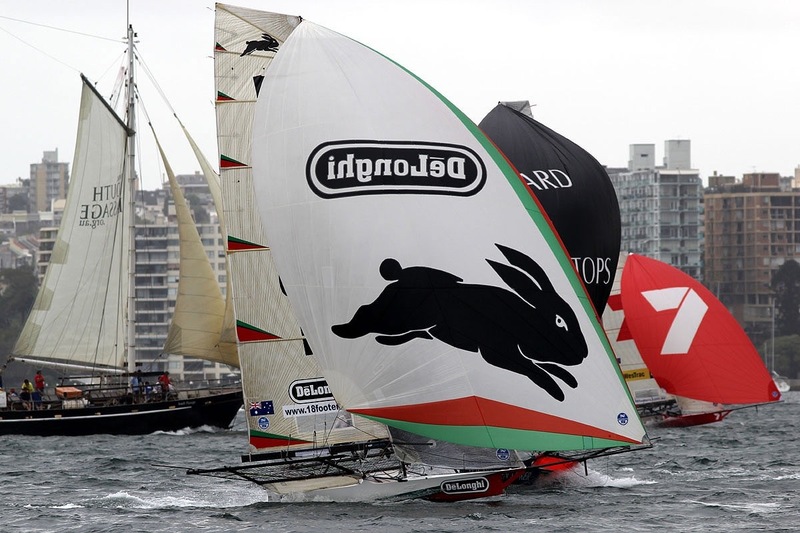 Lumix crossed the finish line 39s ahead of second placed Asko Appliances (Marcus Ashley-Jones, Ash Rooklyn and Geronimo Harrison), with De’Longhi-Rabbitohs (Simon Nearn, Keegan York and James Smithers) just 7s back in third place. 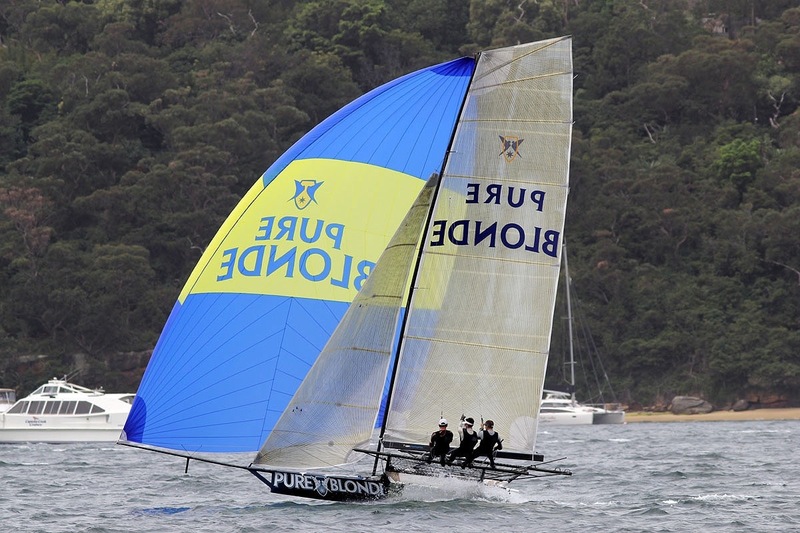 With the last race of the Challenge to be sailed next Sunday, Pure Blonde (Tom Clout, Rob Bell and Matt Wark) leads the points on 28, followed by Asko Appliances on 33, Thurlow Fisher Lawyers (Michael Coxon) on 34, Mojo Wine (James Dorron) 37, Fisher & Paykel (Andrew Chapman) 40 and Gotta Love It 7 (Seve Jarvin) 43. Today’s race was sailed in a moderate SE breeze with the fleet split between the choice of #1 and #2 rigs. Biggest loser from the incident was Coopers-Rag & Famish Hotel (Jack Macartney) which sailed on in the race oblivious of being disqualified. The Rag actually led the race for the first two laps before crossing the finish line in seemingly second place. There was little hard work on the windward legs and the entire race took just 46m58s to complete. Thurlow Fisher Lawyers took an early lead from Gotta Love It 7, which recovered brilliantly after going back at the start. 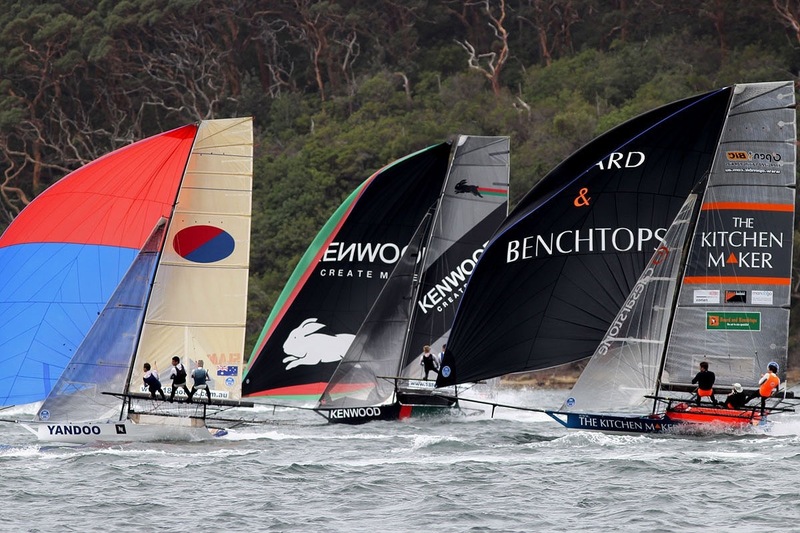 Coopers-Rag & Famish Hotel took advantage of the red buoy rounding to lead Haier Appliances (Pedro Vozone), Lomax Financial Group (Alexandra South) and Thurlow Fisher Lawyers as spinnakers were set for the run back to the bottom mark. 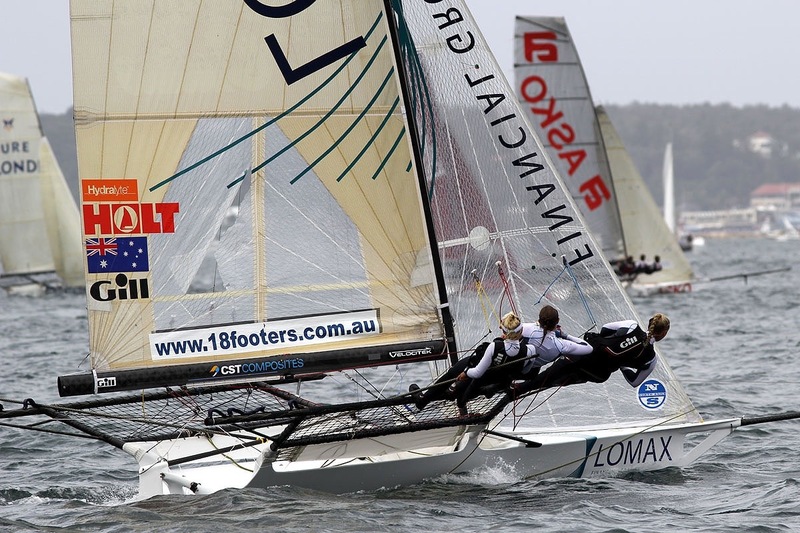 The Rag continued to lead the fleet over the second lap of the course although Lumix had reduced the margin to just 15s. 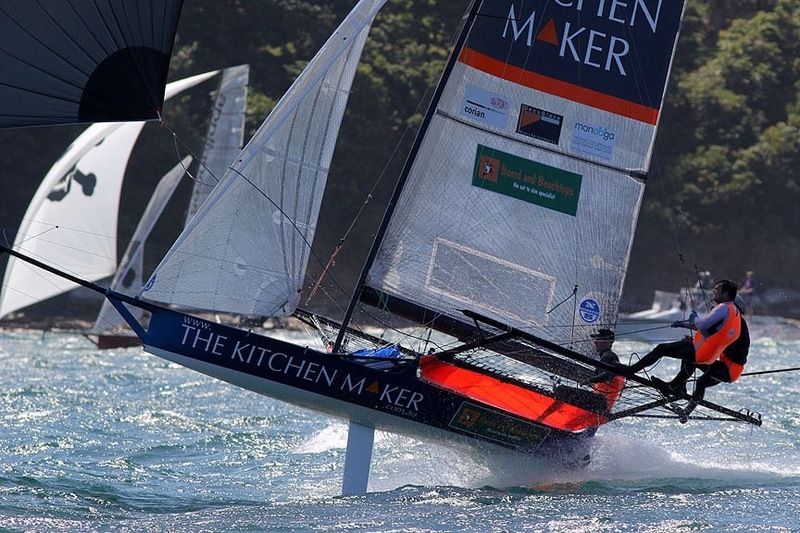 Third place was held by The Kitchen Maker, being sailed today by Olympic Gold Medalist Nathan Wilmot, who was replacing another Olympic Gold Medalist Malcolm Page. Asko Appliances, De’Longhi-Rabbitohs, Haier Appliances, Thurlow Fisher Lawyers, Smeg (Nick Press) and Pure Blonde were in a group which produced some exciting downwind racing. The series has achieved the desired result of producing close racing and seven winners from seven races is proof of its success. An interesting sidelight to the race today was the performance of Brisbane boat Winning Appliances (Shane Smith) which took line honours although only competing by invitation. 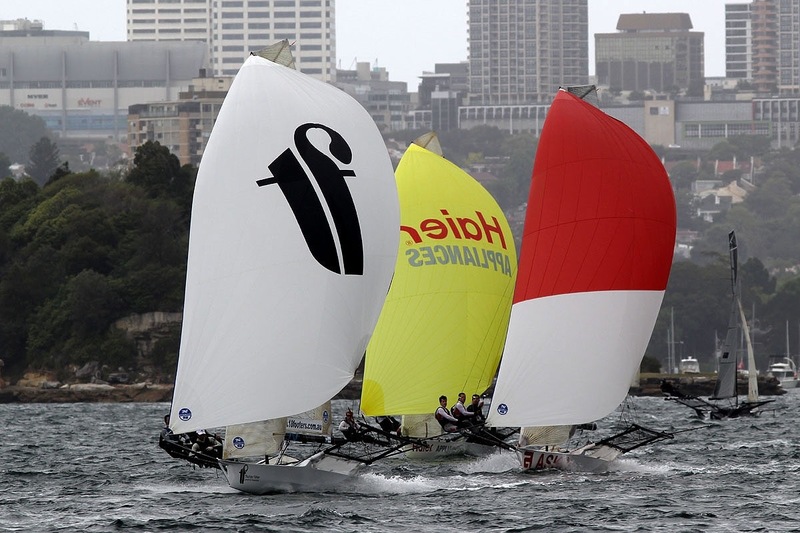 Race 8 (last for the series) of the AEG 3-Buoys Challenge will be sailed next Sunday with the Spectator Ferry leaving Double Bay Public Wharf at 2.15pm. This entry was posted in 18 foot skiff, Uncategorized and tagged 18 foot skiff by Cam. Bookmark the permalink.